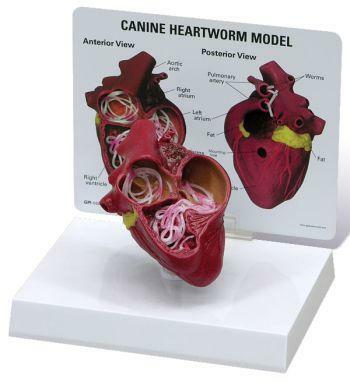 The Heartworm Disease Model is presentation of a dog or a cat's heart, sectioned to show an infestation of the heartworm parasite in the right ventricles and pulmonary artery. The anatomical heart measures 2 3/4" x 4 1/2" x 1 1/2". Heartworm Disease Model may be removed from base.